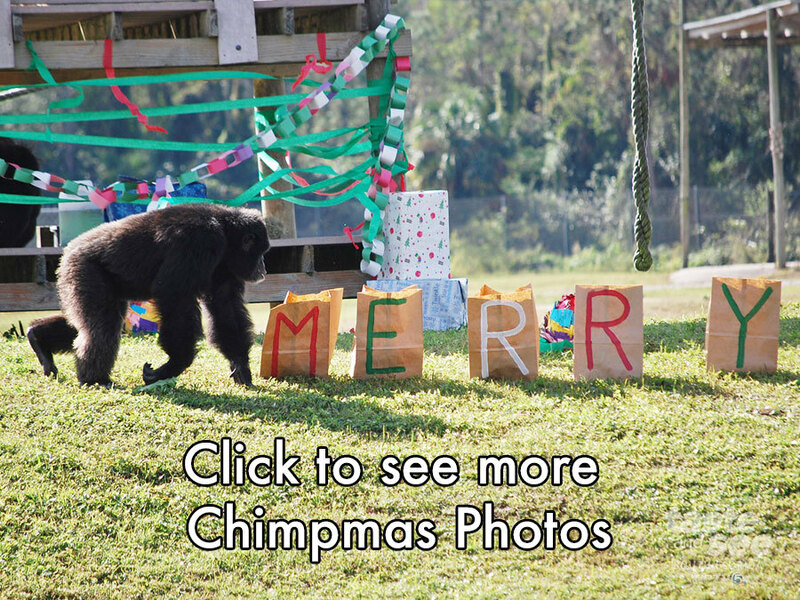 Today at Lion Country Safari 16 chimpanzees got presents delivered from Santa. As Cypress Trails Elementary Chorus sang Jingle Bell Rock, Santa traveled by water sleigh across the moat to pass out gifts. Gifts included edible treats, stuffed animals, clothes and enrichment-themed activities. This year’s Christmas with the Chimps was dedicated to Little Mama, the 79-year-old chimpanzee who passed away in November 2017. Little Mama now has a special mango tree (her favorite) and a memorial marker in her honor on the Observation Island. If you go to the theme park over the weekend there will be additional holiday gifts for the animals and Christmas trees out for the lions and rhinos. This is the 33rd year in-a-row Santa has celebrated Christmas with the Chimps.